In order for us to spotlight hardscapes, we wanted to first define what a hardscape is. A hardscape is a non-organic structure added into landscaping. Often it is combined with traditional organic landscaping to make a stunning entryway into a Homeowner’s Association (HOA), business, or outdoor area. Our team of experienced landscapers and hardscapers have years of experience in designing and installing a variety of hardscape structures. 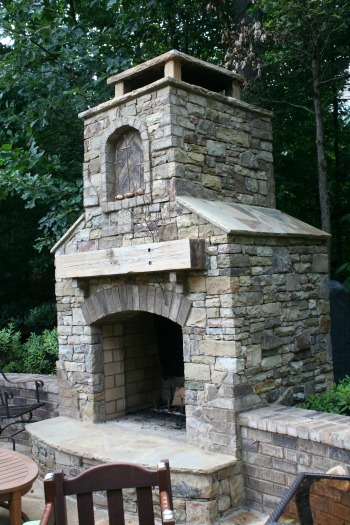 These include outdoor fireplaces, grill islands, pool surrounds, walkways, retention walls, and stairs. When it comes to installing a hardscape for your business, HOA, or residential property, you can let your imagination run wild. From elegant pool surrounds, to functional outdoor kitchens, and to relaxing outdoor cabanas, we have experience with it all. If you need help with the design process our team can easily assist. We are always considerate of what materials to use. Since our work is custom, no two grill islands or outdoor fireplaces are alike. Some clients prefer brickwork, while others prefer stonework. We pride ourselves in quality work that looks natural with the surrounds. As a result, we do not stick to just one material for our installation, we customize according to the demands of the project. Take a look at our portfolio and contact Hutcheson Horticulture today for your hardscape needs in Atlanta.